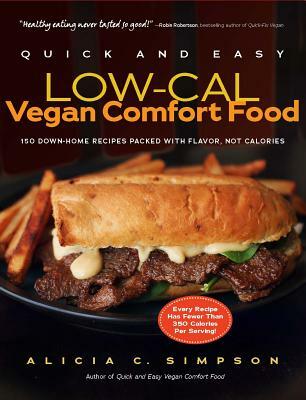 At last, vegan food that packs a heaping helping of comfort without the extra calories! Baked Hush Puppies • Hoppin’ John • Sweet Potato Salad • Meatball Soup • Carolina BBQ Sammich • Chik’n Pot Pie • Kung Pao Tofu • Gyros with Tzatziki Sauce • Butter Rum Pound Cake • Ooey Gooeys • Mexican Hot Cocoa • and more! Every recipe includes detailed nutritional data on calories, carbohydrates, fat, fiber, and more. Plus, suggested daily menus, ranging from 1,400 to 2,000 calories, make it easier than ever to start cooking food that’s good—in every sense of the word! "In Quick and Easy Low-Cal Vegan Comfort Food, Atlanta-based author Alicia Simpson offers dishes that decidedly don't sound like diet food, but each weighs in at around 350 salaries (or fewer) per serving. . . . Simpson's Southern roots come through in her recipes, especially evident in dishes such as Hoppin’ John, Fried Green Tomatoes, Spicy Kale Slaw, and Andouille Gumbo. Beyond the down-home favorites, Simpson explores deliciously new culinary territory. Her Lavender Pancakes sound like something out of a fantasy, her White Lasagna defies dieting, and her Butter Rum Pound Cake will soon become a necessary part of any Sunday brunch." "If you’re vegan and looking for a great way to get or stay in shape and eat right while still enjoying great-tasting, familiar dishes, you’ll enjoy Alicia C. Simpson’s Quick and Easy Low-Cal Vegan Comfort Food."